You have reservations about the cloud. Does it really deliver the ROI you hear about? Are the uptime rates as good as they claim? Will I really see productivity gains a result? You’re intrigued – but cautious. Wish there was a way to incrementally make the move with the lowest risk applications? You can – and your lowest risk avenue is Office – in the Cloud. 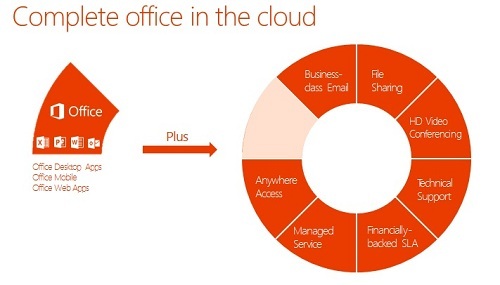 We’ve been using Office in the cloud for quite some time now and I’d like to share what I find to be the biggest benefits. Email – Maintaining business class email can be a challenge for small to mid-sized businesses. Often, outsourced or maintained by a 3rd party, Hosted Exchange is a critical communication tool. Outlook is the #1 productivity tool used in business today. When you decide to move this to the cloud, updates are automatically installed, SPAM filtering is included and you’re able to access email from your computer, from your smartphone, or the Outlook Web App. You’ll gain major benefits and big cost saving as compared to taking it in house. Document Storage and Search – Contracts, documents, Excel files, pictures, etc. Whatever you store to your company SharePoint site is securely accessible from anywhere. I can speak from personal experience that this is a major time saver. The keyword search capabilities scan the content of the files – not just the name – making it even easier to find what you need. Add to that the ability to setup other useful collections, such as discussion boards, announcement centers, calendars and more- you’ll find very creative ways to collaborate throughout the company. Communicate – One of the features I thought would simply be a time waster has turned out to be anything but! Lync is a communication tool that supports not only Instant Messaging, but also voice and video calls. I’ve used this tool more often than I can tell you for screen sharing sessions, voice meetings and conversations. Archiving Lync conversations within Outlook makes it easy to search and retrieve discussions containing details of your conversation. Office Anywhere – The latest versions of the Microsoft Office suite. No longer does someone with a new computer have to save a document or Excel file to an older version in order to share with coworkers. Sounds trivial until you have lived it. When you combine the Office Suite with SharePoint, you can start a document in the office, then work on it again from your home computer and then finish it from another machine. Another added benefit is the ability to install a local copy of Office on multiple machines used by the same individual; you’re not locked into using a Web app that may not be accessible from some areas or devices. My personal experience with Office in the Cloud has been fantastic. If I had one complaint, it would be the need to change my password on a regular basis – and I really shouldn’t complain about that. After all, if it wasn’t secure – it wouldn’t be worth your consideration. RMI Corporation is the creator of ADVANTAGE, a complete business management solution for the equipment industry. Their Office Worker User delivers a robust Office solution along with install and support assistance. To learn more about their Office Worker, click here to see the details.